The 2016 Modern Family Index reveals that personal life and work life are tightly intertwined when it comes to family planning. Employees expecting children are determined to build their families without giving up on career ambitions. Yet they’re worried about careers post-baby, and they’d give up a lot (including money) for an employer that is family-friendly. Employers who have recognized these new parents as a valuable segment of the workforce are poised to gain loyal, engaged employees who will stay long term. 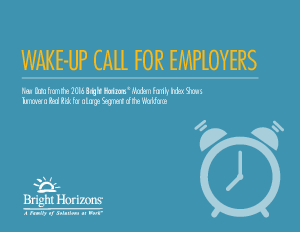 Download the eBook to learn more about this critical issue affecting employee retention. Don’t be left in the dark.